A two-ingredient candy bar recipe that will remind you of a Three Musketeer! 1. Prepare an 8×8″ pan by lining with aluminum foil and coating with nonstick spray. 2. Melt 1 package of CANDIQUIK® in Melt and Make Microwaveable Tray™, as directed on package. 3. Place marshmallow creme in a medium mixing bowl and microwave for 15 seconds to slightly soften. 4. Pour the chocolate CANDIQUIK® on top of the marshmallow creme and use a spoon to stir together. 5. Spoon mixture into prepared pan and smooth evenly across the bottom (mixture will be thick). Place in the freezer for 30-45 mintues until firm. 6. Melt remaining package of Chocolate CANDIQUIK®. 7. Remove from freezer and cut into 2″ bars. 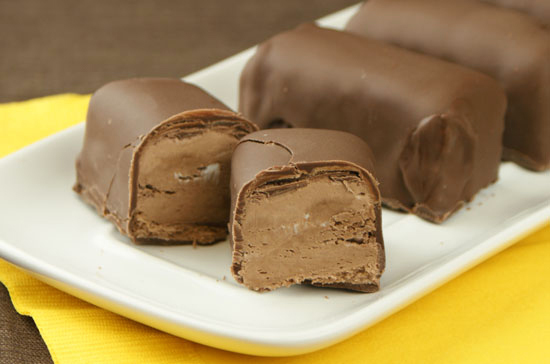 Dip each bar in the tray of CANDIQUIK® and place on wax paper to set. *TIP: to dip the bars, place each bar on a fork and lower into the CANDIQUIK®, use a spoon to completely cover the bar; let the excess coating drip off and place on wax or parchment paper to set.